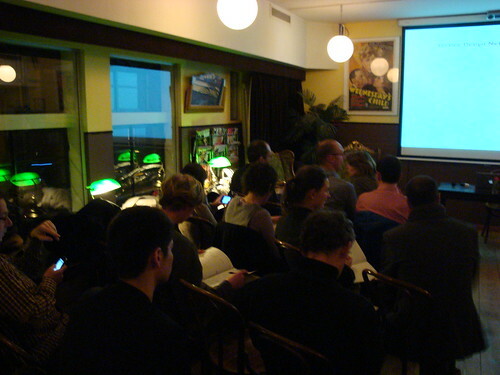 Last week Geke van Dijk and I organized the first edition of the Thinks in 2011. It seems that service design keeps attracting new people as this edition of the Thinks was again filled with a lot of new faces. It’s very rewarding to see such a mixed crowd of designers, entrepreneurs and clients. By taking the highlights of the 2 major conferences last year in Berlin and ServDes in Linköping, we used this edition of the Thinks to talk about the things that stood out in 2010. There was still a lot of discussion on the scope of service design and where it fits in an organization. Someone suggested it was time to introduce a client journey next to the well known customer journey. A topic that really struck a cord with me was the discussion about the ethics involved in service (/social) design projects. What obligations do you have as a designer towards the community that you’ve “dragged” into your project. What happens when your project stops but the participants are still in that context. We didn’t get to clear answers but raising the question and creating awareness was very valuable. 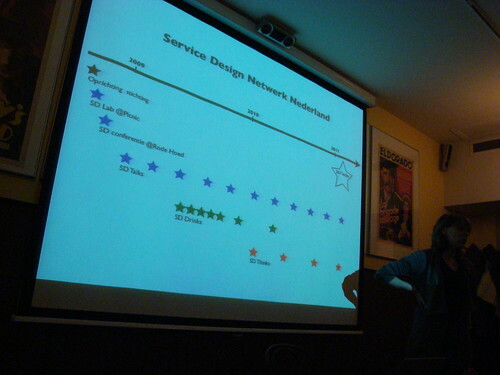 We also looked backed at the first 2 years of the Dutch Service Design Network and also took the opportunity to elaborate on the plans for 2011. This year the network is going to organize more events then ever before. Of course we’re going to keep on going with the Thinks but we’ll also organize more in depth Labs and there are plans for a large conference at the end of this year. We’re always looking for people that want to actively participate in the network so feel free to drop me an email! I really enjoyed this edition of the Thinks mainly due to the very engaged group that turned up. The open format sparked a lot of interesting discussions that kept on going during the drinks. The next edition of the Thinks will be on March 30th. If you want to attend be sure to join our linkedin group in which we’ll post the rsvp announcement.